This private A-Frame lake-view home is close to the Falls Beach. It has a large outdoor wrap around veranda style deck that adjoins to Forest Service land for maximum privacy with an outdoor cabana. 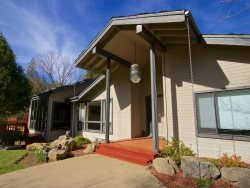 Enjoy watching wildlife from the oversized deck which overlooks a beautiful granite rock out cropping; bring out the inner child and imagine you are camping in the yurt style cabana except that you have the comforts of home just steps away! The cozy home has 2 bedrooms and a loft bedroom & 1 bath. There is a 1 bedroom 1 bath apartment down stairs with separate entrance through the garage. Amenities include fireplace, dishwasher, microwave, VCR/DVD player. 2000 SQ FT of decking 1 Dog allowed with additional $50.00 pet fee and $200 pet deposit.